Glocal Nagoya Backpackers Hostel is located a 7 minute walk (600m) from Shinkansen, the bullet train exit (Taiko-dori side) of Nagoya station. From Nagoya station, you can get anywhere you would like to go by train, subway, bus or bullet train. We are in an area with plenty of restaurants and bars (including our own on the 1st floor!) and a convenience store (Mini Stop) is down the street and across the road. Glocal Nagoya Backpackers Hostel consists of a cafe and bar on the first floor and the guest rooms are on the 2nd, 3rd and 4th floors of the building. 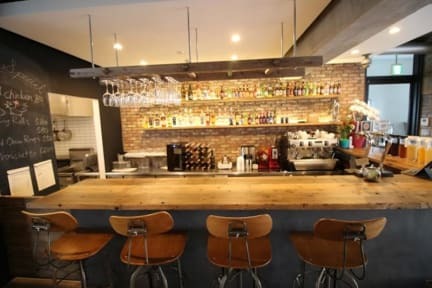 The bar opens from 11am to 11pm (except Mondays and sometimes for private parties). 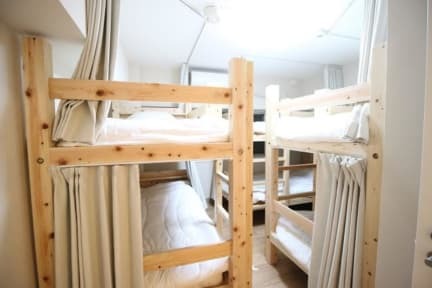 The dormitory rooms range from 4-8 beds and we also have 2 private rooms that fit 4 people (2 bunk beds). All rooms are shared showers and bathrooms. The dormitory bunk beds all have curtains at the side and back of them for privacy. On each head board is a small light and a plug outlet. We also have a female only floor. We have a communal kitchen on the 3rd floor with dining tables. Coin laundry is available. Our cafe and bar features delicious food and beer from around the world. We also all love travelling and would love to chat to you about travel or answer any questions that you may have! 7 days advance notice for free cancellation. Children under 10 are not permitted to stay in the dormitory rooms. However, children under 10 can stay in the private rooms. 4).Check-in time is 2-11pm. Check-out time is 11am. 5).The entire building is smoke-free.